We all look for comfort when it comes to dressing up, and this combination of a white knit crew-neck t-shirt and black sunglasses is a good illustration of that. You could perhaps get a little creative in the shoe department and dress up your getup with grey espadrilles. If you're a fan of functionality dressing when it comes to your personal style, you'll love this incredibly stylish combo of a beige coat and black sunglasses. To add oomph to your getup, finish off with black leather knee high boots. We all want comfort when it comes to dressing up, and this combination of an olive military jacket and RetroSuperFuture ora sunglasses from farfetch.com is a great example of that. Let's make a bit more effort now and rock a pair of black leather ankle boots. If you're all about practicality dressing when it comes to your personal style, you'll love this absolutely stylish pairing of an olive parka and RetroSuperFuture ora sunglasses from farfetch.com. 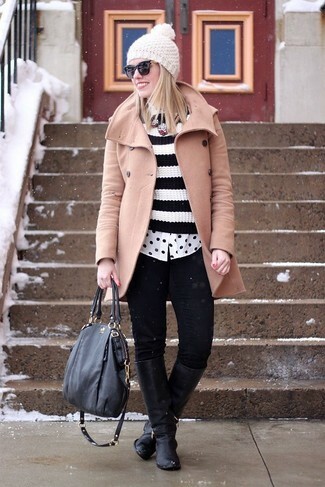 Up the cool of your outfit by completing it with dark brown snow boots. Rock a white and black shawl cardigan with RetroSuperFuture ora sunglasses from farfetch.com to be both knockout and relaxed. If you're a fan of relaxed dressing when it comes to your personal style, you'll love this extra adorable combination of a black crew-neck sweater and RetroSuperFuture ora sunglasses. Bump up the cool of your look by completing it with black elastic ankle boots. If you're a fan of practicality dressing when it comes to fashion, you'll love this extra cute combo of a grey sweatshirt and black sunglasses. Up the cool of your getup by finishing off with black suede ankle boots. We're all looking for comfort when it comes to dressing up, and this combination of a black silk swing dress and RetroSuperFuture ora sunglasses from farfetch.com is a practical illustration of that. Wearing a pair of black suede over the knee boots is a simple way to add extra flair to your ensemble. We're all outfiting for comfort when it comes to dressing up, and this combination of a white knit oversized sweater and RetroSuperFuture ora sunglasses from farfetch.com is a perfect example of that. Got bored with this getup? Enter black leather ankle boots to switch things up.